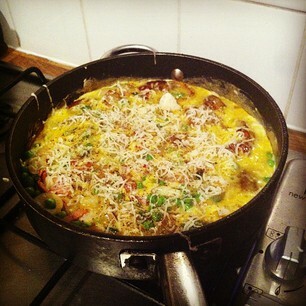 I made this frittata the other night for dinner and it was lovely. 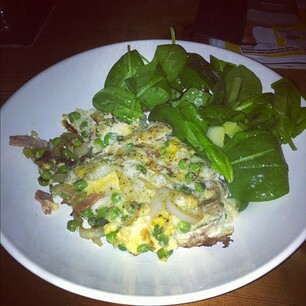 I messed around a little with the recipe and added potatoes as I like my frittata to have some substance i.e. I need carbs on my plate. This is quick, easy and perfect served with some salad for a mid-week meal. Heat more oil in a large frying pan and fry the bacon for 2-3 mins. Add the onion and continue to fry for another few minutes before adding the spring onions. Sweat for 4-5 mins. Stir in the peas and heat through then stir in the basil. Cut one of the pieces of goats cheese into chunks and scatter on top of the vegetables then turn the heat off. Heat the grill to the highest setting. Beat the eggs in a small bowl and then add to the potatoes along with the grated parmesan and lots of black pepper. Tip in the veg from the frying pan and mix gently. Put the frying pan back on the heat and then tip in the potatoes/veg/egg mixture. Turn the heat to low and then grate the rest of the goats cheese onto the top of the frittata. Add more black pepper then place a lid on the frying pan. Allow to cook on a low heat for 5-10 minutes then place frying pan until the grill until the top has set. Cut into wedges and serve with salad and a nice glass of Sauvignon Blanc! 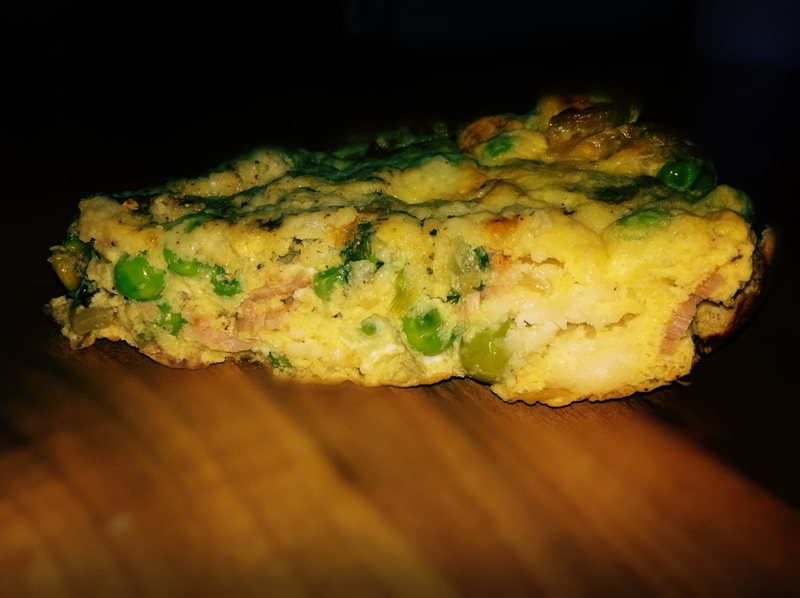 I love a good frittata, yum! It looks so good! I quite enjoy a cold slice of leftover frittata!